Note: More than one method may be used by a woman, but these data only reflect most effective method used. 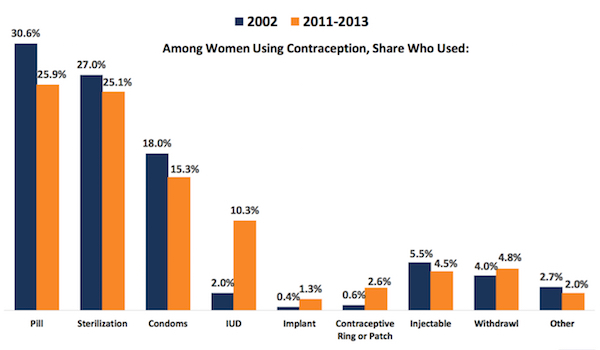 Data Source: Daniels K, Daugherty J, Jones J, & Mosher W. Current Contraceptive Use and Variation by Selected Characteristics Among Women Aged 15-44: United States, 2011-2013. National Health Statistics Reports; no. 86. November 10, 2015. This entry was posted in Medicine and Society Data Watch on June 22, 2016 by Christopher Barbey.